RESTON, Virginia, April 9, 2014 (ENS) – The North Atlantic region is a pathway for bird flu to move between Europe and North America, U.S. Geological Survey scientists and their Icelandic partners have discovered. Across the world, a separate team of USGS scientists found sea otters infected with human influenza. 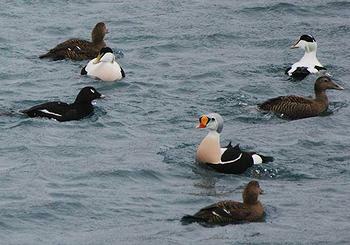 USGS and Icelandic scientists found avian influenza viruses originating from both North America and Europe in migratory birds in Iceland, demonstrating that the North Atlantic is as important as the North Pacific as a melting pot for birds and avian flu. A great number of wild birds from Europe and North America congregate and mix in Iceland’s wetlands during migration, where infected birds could transmit avian flu viruses to healthy birds from either location. By crossing the Atlantic Ocean this way, avian flu viruses from Europe could eventually be transported to the United States. This commingling could also lead to the evolution of new influenza viruses. These findings are critical for proper surveillance and monitoring of flu viruses, including the H5N1 avian influenza that can infect humans. Published March 19 in the journal “PLOS ONE,” the study demonstrated for the first time that gulls play an important role in moving avian flu viruses across the North Atlantic. During the spring and autumn of 2010 and autumn of 2011, the USGS researchers and Icelandic partners collected avian influenza viruses from gulls and waterfowl in southwest and west Iceland. “For the first time, avian influenza viruses from both Eurasia and North America were documented at the same location and time,” said Jeffrey Hall, USGS co-author and principal investigator on this study. H5N1 is the original avian influenza that broke out in Asia in late 2003 and early 2004, killing and causing the culling of millions of chickens and ducks. Dusek and his team isolated and fully sequenced the genomes of 29 avian influenza viruses from wild caught gulls and waterfowl in Iceland. The scientists detected viruses that were entirely of American lineage, viruses that were entirely of Eurasian lineage, and viruses with mixed American-Eurasian lineage. “Viruses are continually evolving, and this mixing of viral strains sets the stage for new types of avian flu to develop,” said Hall. The partners on the new study include the Southwest Iceland Nature Research Institute, the University of Iceland’s Snaefellsnes Research Centre, the University of Minnesota and the J. Craig Venter Institute. This study was funded by the USGS and the National Institute of Health’s Centers of Excellence for Influenza Research and Surveillance. In a separate flu study by USGS scientists on the Pacific coast of North America, sea otters living in the waters of Washington State were found to be infected with the same H1N1 flu virus that infected humans in 2009, causing a world-wide pandemic. “Our study shows that sea otters may be a newly identified animal host of influenza viruses,” said Hon Ip, a USGS scientist and co-author of the study. 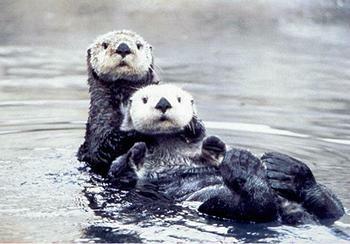 During an August 2011 health monitoring project, USGS scientists, working with researchers from the U.S. Centers for Disease Control and Prevention, found evidence that the Washington sea otters were infected with the pandemic 2009 H1N1 virus, although the exact date and source of exposure could not be determined. The researchers discovered antibodies for the 2009 H1N1 flu virus in blood samples from 70 percent of the sea otters studied. None of the otters were visibly sick, but the presence of antibodies means that the otters were previously exposed to influenza. Further tests concluded that the antibodies were specific to the pandemic 2009 H1N1 flu virus, and not from exposure to other human or avian H1N1 viruses. This study is the first time that evidence of influenza infection has been detected in sea otters, although these viruses have been found in many different animals, including ducks, chickens, pigs, whales, horses and elephant seals.